The work of a fashion journalist can be quite varied. Typical work includes writing or editing articles, or helping to formulate and style a fashion shoot. A fashion journalist typically spends a lot of time researching and conducting interviews and it is essential that he or she has good contacts with people in the fashion industry, including photographers, designers, and public relations specialists. Fashion journalists are either employed full-time by a publication or are employed on a freelance basis. 30 years at Vogue: how Anna Wintour changed the way the world gets dressed - "In her years as editor of American Vogue, Wintour has invented soft power dressing and become as famous as her celebrity cover stars. Lionised and satirised, respected and feared - could she now be ready to abdicate?" Beyoncé in Vogue: ‘We Will All Lose’ Without Diversity - "That is why I wanted to work with this brilliant 23-year-old photographer Tyler Mitchell," she told Vogue for this year’s September issue. Gazette du Bon Ton - was a small but influential fashion magazine published in France from 1912 to 1925. Hillary Clinton to guest-edit December issue of Teen Vogue magazine - The Guardian. Journal des Luxus und der Moden - (1787-1812). LIST OF FASHION MAGAZINES - Wikipedia. LIST OF MEN'S MAGAZINES - Wikipedia. LIST OF WOMEN'S MAGAZINES - Wikipedia. Vogue, get off your high horse - fashion shows have changed - The Guardian. A CURIOUS MIND - voted twice as one of the top 100 menswear blogs on Tumblr worldwide and offers a really cool, opinionated twist on higher end mens clothing and lifestyles. A MAGAZINE - biannual publication, exploring the creative sphere of a selected designer in each issue. BOF | BUSINESS OF FASHION - "Essential daily resource for fashion creatives, executives and entrepreneurs in over 150 countries. It is frequently described as "indispensable," "required reading" and "an addiction." BRIGITTE - Germany's leading fashion magazine. Broke and Bespoke - "A site meant to inspire penurious sartorialists everywhere..."
BRYAN BOY BLOG - "A fashion blog featuring pics, photos, images, videos and commentary on trends and pop culture." CANDY - "	The first fashion magazine ever completely dedicated to celebrating transvestism, transexuality, cross dressing and androgyny, in all its manifestations." CELEBRITY CLOTHING LINE - focused on the tightly knit world of celebrities and fashion – you can’t have one without the other. We feature breaking news, latest celebrity trends, "as seen on" critiques and brand launches. CELEBRITY STYLE GUIDE - "The Original Guide to Celebrity Style and Fashion." CITIZEN K - fashion & lifestyle magazine. Close Up and Private - since 2009. Fashion-forward photography project dedicated to the visual language of style and celebrating classic details and contemporary looks through unique photographic documentary. CR Fashion Book - founded in 2012 by Carine Roitfeld, former editor-in-chief of French Vogue. DANDYISM.NET - aims to be effortlessly elegant, caustically witty, coldly superior and dryly amusing. Its editorial policy is caprice. DAZED DIGITAL - Dazed & Confused Magazine. DIE, WORKWEAR! - "A menswear blog devoted to the good life." ELLE - find fashion trends, discover hairstyles and more. ES MAGAZINE - dedicated to London glamour, fashion and beauty. Europeana Fshion Portal - "Discover hundreds of thousands of fashion items from Europe's richest collections." FABSUGAR - celebrity fashion, shopping & style. FASHION LOVER - brings you daily updates from the fashion world, style and trends. FASHION NET - "The insider's guide to all things chic." Launched in January 1995, Fashion Net was Internet's first fashion site. FASHION SPOT - runway/news, style/trends, celeb fashion, beauty, community, shop. FASHION TV - since 1997. "Inspires its audience by providing an insider's view of the fashion industry in a highly desired clip-based content. The only TV equivalent to fashion print media appealing to everyone interested in fashion, style, beauty and trends, fashiontv understands and caters to its audience by providing original, unbiased and informative programming not available on other networks." FASHIONISING.COM - fashion inspiration, latest fashion trends and fashion social community. FASHIONISTA - fashion designers, models, shopping & style. First View - "firstVIEW is the world's oldest online fashion database and photo archive, offering coverage of fashion shows from around the world. firstVIEW has been an industry leader since its inception in 1995." Garage Magazine - biannual print publication that brings to life the most original and ambitious collaborative projects across contemporary art and fashion. The magazine was launched in 2011 by Editor-in-Chief Dasha Zhukova, taking its name and spirit from Garage Museum of Contemporary Art in Moscow - the groundbreaking international art institution founded in 2008. GENTLEMAN'S GAZETTE - "The Gentleman's Gazette is an award winning online magazine for men who are interested in elegant classic clothing, culture, accessories, style & savoir vivre in general and all the finer things in life, with a strategic focus on high quality, rare and unique goods or services." GQ | GENTLEMEN'S QUATERLY MAGAZINE - "Look Sharp - Live Smart." GRAZIA DAILY - daily digest of fashion, beauty and A-list news. HARPER'S BAZAAR - the style resource for "the well-dressed woman and the well-dressed mind". HIGHSNOBETTE - daily online magazine for womens streetwear, fashion and accessories. HIGHSNOBIETY - daily online magazine for sneakers, streetwear, fashion, art, and toys. HOW TO SPEND IT - FASHION - weekly magazine published with the Financial Times Weekend Edition. HYPEBEAST - "A premiere online magazine for lifestyle encompassing fashion, arts, design, culture and lifestyle." i-D MAGAZINE - the original fashion and style bible. I *HEART* THAT - fashion, celebrities, styles and trends. "We here at iheartthat.com strive to bring you only the latest in fashion and comment on the current trends that the celebrities and models are wearing." INDUSTRIE MAGAZINE - a magazine dedicated to the culture of fashion. Snapshots of the personalities and moments which shape our industry. INSTYLE - fashion, beauty, hair and celebrity style. L'Officiel - French fashion magazine, the complete name of the magazine is "L'Officiel de la couture et de la mode de Paris". It has been published in Paris since 1921 and targets upper-income, educated women aged 25 to 49. LOULOU MAGAZINE - "Style / Shopping / Stars." LOVE MAGAZINE - "Fashion & Fame." Celeb gossip, recipes, fashion, beauty and real life stories! LUCKY - the magazine about shopping & style. MARIE CLAIRE - hair styles, women's fashion, beauty products, and realtionship advice. MAXMINIMUS - "Style anthropology can explicate a lot of otherwise tricky issues, in some cultures probably more than others. Sort of like water for chocolate, only weejuns..."
MEN'S FLAIR - "Style aficionados' chronicles." Online men's fashion and style magazine. MUSE THE FASHIONART MAGAZINE - "Fashion goes deeper than a look!" MY FASHION LIFE - fashion blog with a global approach to style and culture. NEW YORK MAGAZINE - fashion & style on New York Magazine: designers, runway shows, trends, news. OHLALAMag - "Hollywood infusion." Internationally acclaimed online fashion and photography magazine about fabulous people, style, culture, entertainment, art and travel. POR HOMME - men's lifestyle, fashion, footwear and culture magazine. PURPLE FASHION MAGAZINE - French fashion, art and culture magazine founded in 1992. PUT THIS ON - "A web series about dressing like a grownup." RACKED - Shopping and Style Intelligence." Racked obsesses about retail and shopping - from sidewalks to catwalks - in the country's most influential fashion centers." RETRO VINTAGE MOD STYLE - "A place where Retro, Vintage, & Mod Style meet." SELECTISM - online fashion magazine. "Here at Selectism we concentrate on bringing you the latest news on innovative street fashion." SLAMXHYPE - "Launched in 2003 with a mission statement around filtering the best news around the web and within media into one place, bringing street culture to one place, a creditable and reliable source for anyone around the world. Slamxhype has a strong focus on not just fashion but its surrounding culture; film, design, music and especially art." SOCIAL LIFE MAGAZINE - luxury, lifestyle and fashion. STYLE.COM - the online home of Vogue. Contains fashion news reporting, trend reports, and extensive galleries of fashion-show photos. STYLE PANTRY - "Daily style, outfits, fashion finds, and lookbooks." STYLE ROOKIE - Tavi Gevinson's blog. 13-year old American fashion blogger. STYLECaster - since 2009. "Style News and Trends." STYLEITE - dedicated to giving you the latest and greatest in fashion and beauty news, insight, and commentary. Stylehive - "Get updates from your favorite brands, style experts and stylish people from around the world...instantly! Ever seen someone on the street who's style is so cool, you just want to follow them from store to store and find out their style secrets? Well at Stylehive.com, you can! Stylehive.com is an online style club for people who live for fashion, design and shopping. It's where you meet your style muses and follow them as they discover and share their latest finds. SUBSTANTIVE STYLE - a storyboard for the men's style magazine Men of Habit. SWAGGER 360 - for everyone who understands that there is a big difference between style and fashion. Fashion is what you buy, style is self expression and how you live. T (NEW YORK TIMES) - a perfect-bound magazine dedicated to fashion, living, beauty, holiday, travel and design coverage. T MAGAZINE BLOG (NEW YORK TIMES) - blog dedicated to fashion, living, beauty, holiday, travel and design coverage. The Fashion Law - a leading source of breaking news, fashion law and the business of fashion. TEEN VOGUE - "Fashion starts here". The 12ish Style - "Style for size 12ish-18ish girls living in a size 2 world." The Business of Fashion - since 2007. "Has gained a global following as an essential daily resource for fashion creatives, executives and entrepreneurs in over 200 countries. It is frequently described as 'indispensable,' 'required reading' and 'an addiction.'" THE CHAP - "A Journal for the Modern Gentleman." THE CHIC GEEK - independent online men’s style magazine for any man interested in his personal appearance. THE FASHION SPOT - "Where Fashion & Community Meet." Fashion tips, styles, accessories, runway shows, celebrities and more. THE GENTLEWOMAN - biannual style magazine for a new decade. Featuring inspirational, international women. The Journal of Style - "A blog dedicated to bespoke tailoring, handmade shoes and more ..."
The Monsieur - "Stylish men's guide to living: men's style, luxury watches, global issues." THE RAKE - "The Modern Voice of Classic Elegance." THE RUBINACCI CLUB "IL CLUB" - "The Club will be a meeting point where people can share and comment photos, and, together with me, compare notes…to let the new generation know how to find in the classic a new way to live fashion." THE SARTORIALIST - selected as one of Time Magazine's Top 100 Design Influencers. TREND HUNTER MAGAZINE - "#1 in Trends. The largest community for Trends, Trend Spotting, Cool Hunting, Innovation, Fashion Trends, Style, Luxury Trends, Gadgets, Celebs, Technology, Pop Culture, Art and Design." TREND HUNTER LISTS - clusters and slideshows. V MAGAZINE - since 1999. A magazine about fashion with a capital F and all the things that go with it: art, music, film, architecture. VOGUE - fashion and lifestyle magazine published in eighteen countries by CondÉ Nast Publications. 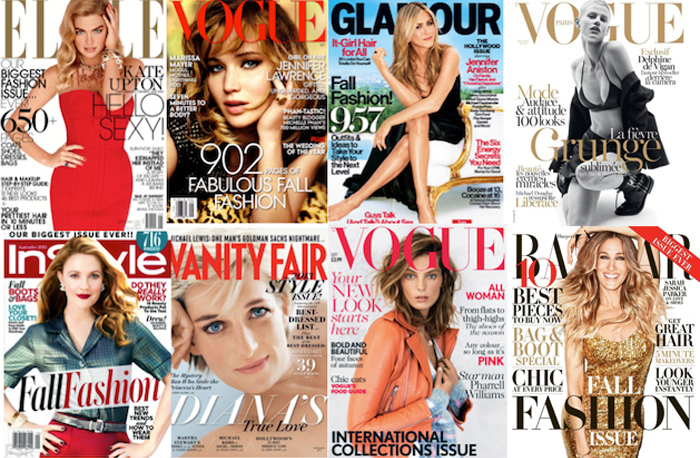 Each month, Vogue publishes a magazine addressing topics of fashion, life and design. VOGUE ITALIA MAGAZINE - English online edition. VOGUE PARIS MAGAZINE - since 1920. Wikipedia. W MAGAZINE - a monthly American fashion magazine, also known for its coverage of American and European society. Many of these society luminaries, as well as the elite of the entertainment and fashion industries, have allowed W into their homes for the magazine's W House Tours feature. WOMEN'S WEAR DAILY MAGAZINE - fashion, beuty and retail news. XOJANE.COM - "Where women go when they are being selfish, and where their selfishness is applauded." YVES SAINT LAURENT: L'UVRE INTÉGRAL, 1962-2002 - limited edition: 500 numbered copies.